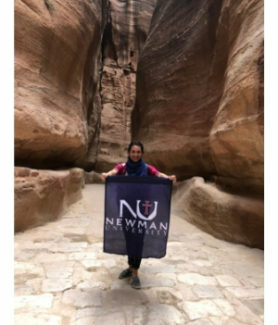 Newman University theology graduate students experienced the Holy Land during spring break. 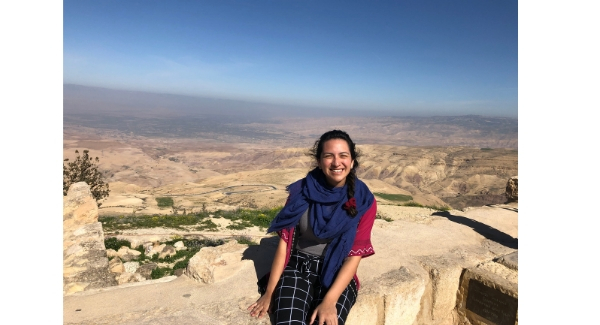 Spring break is often spent on a beach or visiting tourist sites but most students don’t find themselves on the beaches of the Dead Sea or viewing the Promised Land. 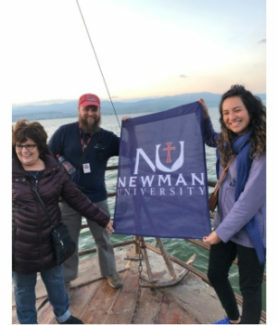 This year, 46 individuals traveled to the Holy Land with the Newman University graduate theology program March 7-17. 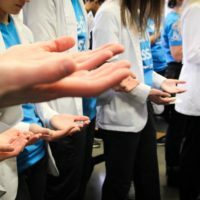 The program hosts the trip every other year, alternating with a trip to Rome. 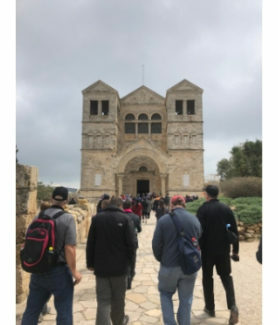 Assistant Professor of Theology Matthew Umbarger and Dean of the School of Catholic Studies Father Joseph Gile take the lead on the pilgrimage each year and offer their knowledge and expertise to those on the trip. 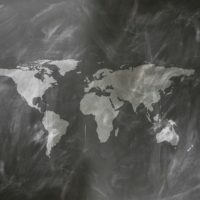 Umbarger used to live in Israel and enjoys returning and sharing his experience with students and their friends and family. This year was Gile’s third trip to the Holy Land and he’s already looking forward to returning in 2021. 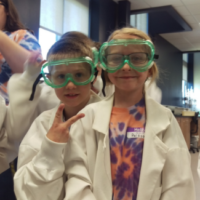 “Really, it was one highlight after another every day of the trip,” said Gile. The group booked a tour bus with 50 seats available and allowed all graduate theology students, past and present, to join and invite their friends and family in order to fill seats. 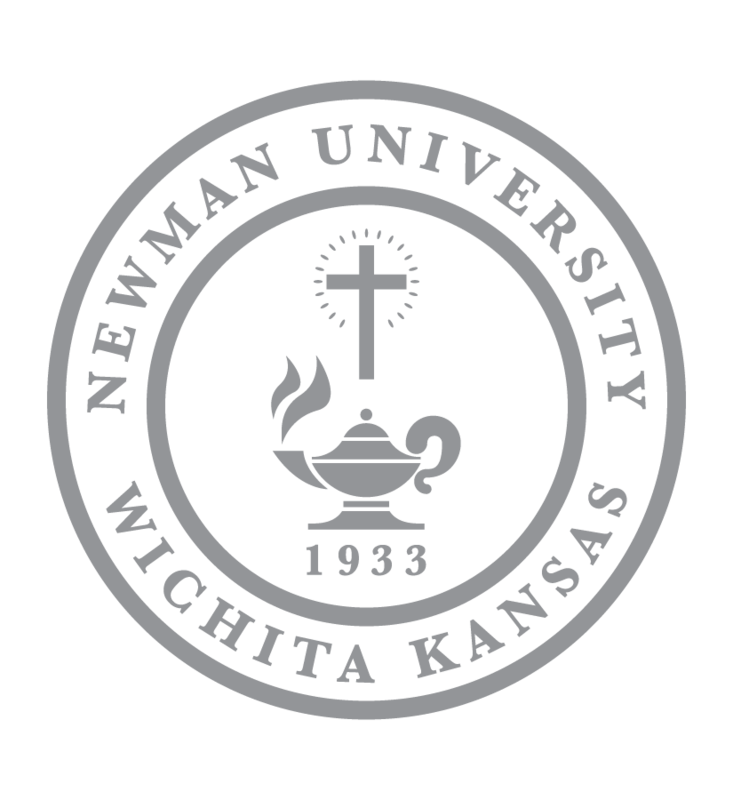 Admissions Counselor Paola Nuñez is currently in the graduate theology program and said she felt like she had an entourage. Her mother joined her on the trip along with four of her friends. Nuñez and her mother also joined the trip to Rome last year and found that traveling with experts such as Umbarger and Gile makes the trip a more fruitful experience. The group covered a lot of ground during the week. Starting in Israel, they ventured through Nazareth, Galilee, crossed over a bridge into Jordan and then came back to Israel to spend time in Jerusalem, Bethlehem and Palestine. Studying the Old Testament and New Testament in class before the trip, many students said, makes the Holy Land experience more meaningful. During their first segment in Israel, one of Nuñez’s favorite experiences was a boat ride on the Sea of Galilee. “There are a lot of things in the Bible that happened in the Sea of Galilee. It was really peaceful. The sun was setting and you really got the feel of being one of the apostles, being one of the disciples,” she said. The group also did the stations of the cross, which follows the path of Christ as he was crucified. Nuñez said what she and many others fail to realize, is that modern life has taken over the historical setting. Shops, restaurants and restrooms line the path and little plaques pertaining to their pilgrimage can be found between them. Gile enjoyed celebrating Mass with the group inside the Crusader chapel next to the Holy Sepulcher. “This chapel was hewn out of solid stone and I could just see those Crusader knights kneeling down for Mass a thousand years ago,” he said. Jordan was a highlight for Nuñez and Gile both. 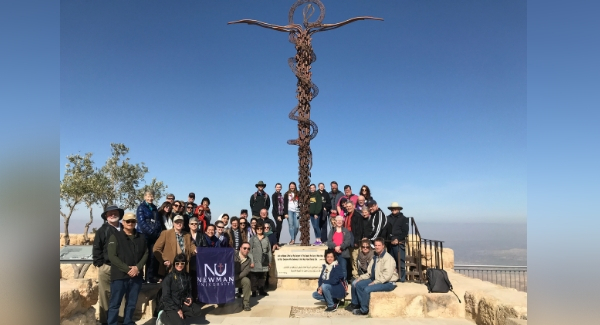 Gile said, “In Jordan, we visited Mount Nebo, which required a steep drive up a very imposing mountain. But the view from on top was spectacular. Mount Nebo, of course, was the final stop in the journey for Moses. He was allowed to go up on top of Mount Nebo and look down. From up there, one can look down and see the sweep of the entire Promised Land right at one’s feet. The group also visited the site of Jesus’ baptism on the Jordanian side, which is considered to be more authentic. Gile said, “The Jordan River has changed its course some since the time of Christ, but there is still a stone staircase from another sixth-century church down to a cruciform spot where tradition says Jesus was baptized. Nuñez said there was a lot of hiking in Jordan that wore the group out. They visited Petra, made famous by an Indiana Jones movie, and their hotel was right on the beach of the Dead Sea. The group stayed here on their last day and had all morning to relax and enjoy the empty beach, which seemed to be the perfect conclusion to their adventure. It gave the pilgrims a time to bond and reflect on their journey. The four-hour hike to Petra was rough on the group but Nuñez said for everyone, including their bus driver, it was Gile who got them through. He had a face full of joy the entire time that kept everything in perspective. “When we were on Mount Nebo, his homily was awesome. It made me cry,” said Nuñez. “He’s just amazing because he really helped you realize where you were and how important it is. Not just in a historical context, but to you as a person living right now. 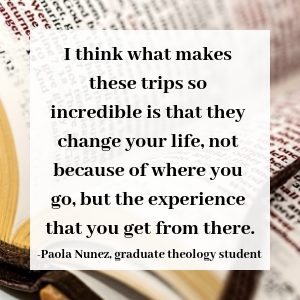 “I think what makes these trips so incredible is that they change your life, not because of where you go, but the experience that you get from there,” said Nuñez. “And I was talking about Father Gile and Dr.Umbarger, they’re not just tourists with you. You’re not just going there and taking pictures and leaving. They make sure you get a sense of where you are, why you are. One thing Gile knows pilgrims gain from an experience like this is a renewed and revitalized faith, he said. “In Nazareth, there is only one source of water — a well. And, back then, it was the work of women and children to go get water every day for the family to use. So we know that Mary and Jesus, as a boy, both had to have been on that spot. A church is built over the well, which makes for a very prayerful encounter. And this happens all the time in the Holy Land. To go to places where we know Jesus truly walked, well, it’s impossible to find that anywhere else.